Here are the two battalions of a Hungarian regiment raised in 1741 which accounts for it's red flags. 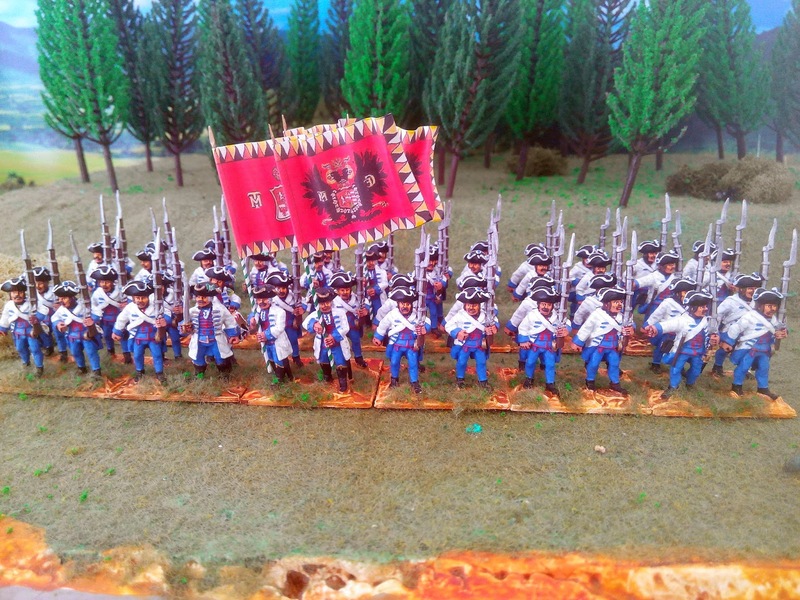 For details on these red Austrian flags you will have to go back to a post on this blog from the 16th October 2010. Now this regiment Haller had rather an inauspicious beginning. This comes from Kronoskaf. "On October 21 1741, at the beginning of the War of the Austrian Succession, Samuel Baron Haller obtained a letter patent authorising him to raise a new regiment of 4 battalions (a total of 3,639 men in 20 companies). Recruitment had to be done in Hungarian and Transylvanian counties and the regiment had to muster in Szegedin. Recruitment proceeded very slowly and, by the end of the year, only four weak companies had been formed. Baron Haller then asked the Hofkriegsrat (Court War Council) for help. In 1748, a battalion was assigned to the corps of FML Batthyányi. At the end of April, it joined the main army at Roermond and was attached to FZM Gaisruck's Corps along with the grenadier companies of the army. By June 18, the entire regiment (only 1,068 men fit for service) was reunited at the camp of Boxtel. 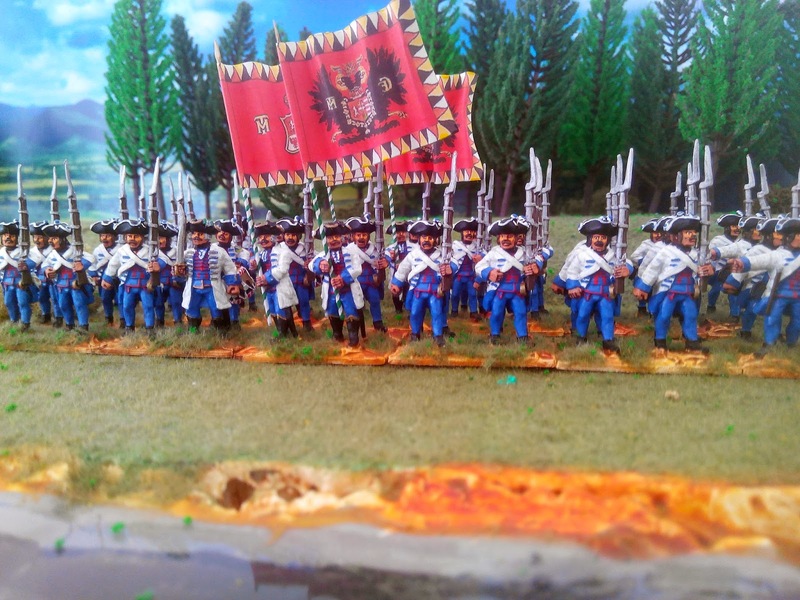 In October, after moving back to Roermond, the entire army marched back towards the Habsburg Hereditary Lands. Even though soldiers had not been paid for several months, the march proceeded without major incidents. In December, the regiment arrived in Prague where it assumed garrison duty. At the end of December, Colonel Thomas Papp was appointed Head of the Invalides in Pest and Lieutenant-Colonel Josef Bakits was transferred to Andrássy Infantry as colonel." Fantastic figures, great painting! 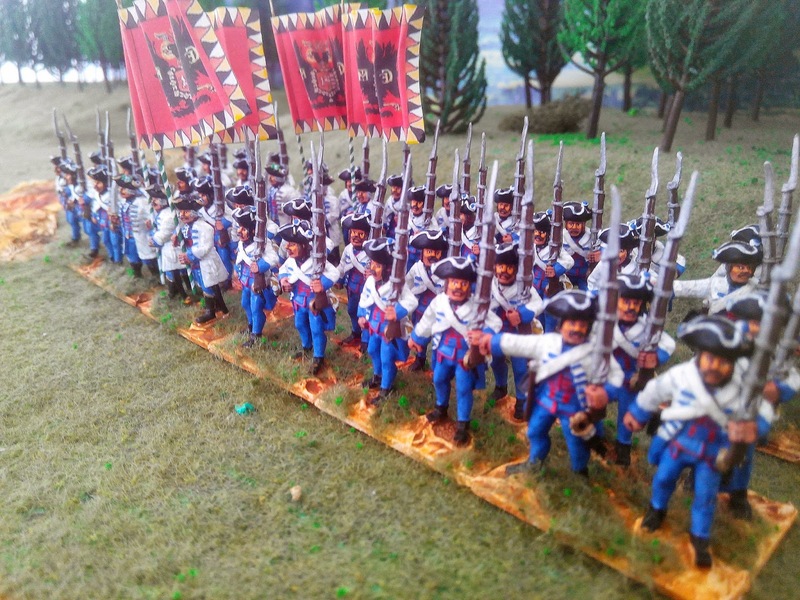 I purchased the figures SYW Austrians in 15 mm, but there is no comparison with your 28 mm.